For cats and dogs skin and ear health, Epi-Otic skin and ear cleanser is the best option. It helps to clean the skin from debris or any dead skin buildup after an injury. The cleansing solution removes any dirt and infectious bacteria. It is a non-irritant cleanser, which produces soothing effect in pet ears and controls ear odor. Used for routine ear cleaning, this antiseptic ear drops contains anti-adhesive properties which helps to prevent buildup of bacteria and yeast. With neutral pH level, Epi-Otic is highly effective in treating severe Otitis externa. 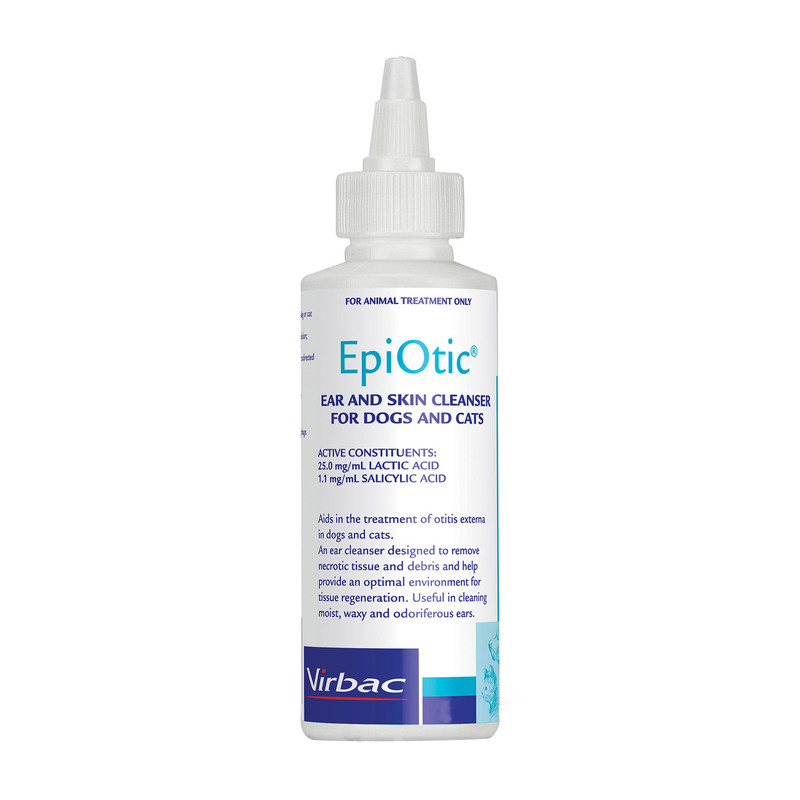 Epi-Otic is one of the highly used skin and ear cleansers for dogs and cats. Epi-Otic contains key ingredients such as Salicylic acid and Lactic acid. These components control bacterial and fungal infection. It helps to remove debris and excess wax, and keeps ears clean. This skin cleaning solution rejuvenates damaged cells and tissues. Refreshing ear canal, this topical solution protects skin from infection and ears from bad odor. For skin care, check directions of use on the package. Shake the bottle before opening the bottle. Open the cap to place the nozzle of the bottle over the ear canal. Put 3 to 4 drops of Epi-Otic solution into the ear or as per your vet’s advice. Gently massage at the base of your pet’s ear. This helps to loosen the hardened wax and debris. When the excess wax and debris comes out, swap away with the help of cotton wool. Put these drops two or three times in a day or according to your vet directions. Epi-Otic skin and ear solution is an antiseptic cleansing treatment for dogs and cats. It helps to remove hard wax and debris from pet ears. The topical treatment controls infection and ensures health. This scientifically proven formula effectively treats otitis externa in dogs and cats. It assists in removing necrotic tissue and debris. For topical use only, do not ingest in pet. No possible contraindications seen on using this product. I have a female cocker spaniel which is a breed notorious for infections in their ears. After bathing, I always put Epi-Otic Ear and Skin Cleanser drops in her ears. My spaniel is 12 years old and has never had an ear infection. In fact the vet always says that she has the cleanest cocker spaniel ears she has ever seen! This product is excellent when it comes to large floppy ears, susceptible to ear infections. It keeps my furry pal protected from ear infections and also keeps his ears dry and clean. My pup was suffering badly from stinky ears and coffee color gunk in the ears. He was constantly scratching his head. I used this product and the result has been amazing. He has stopped scratching his head. There is no sign of color gunk in the ears. The great thing is that it is also great on the skin of my furry pal. A highly recommended product!! !